As part of the new Post Feature, our Topic pages are also being updated to be more consistent with the new Beta Home Feed Page—adding the Question/Post field, updating the visual design, and providing greater interactivity. We currently have the detail view ready, but would like to get some feedback on the condensed view option. If you're a fan of the condensed view, then please take the following short survey to let us know your preference. Thank you for the information. Under My Followed topics and Vmware as an example I do not see an answer view listed and probably missing it since I am tired. Brian, that Answer Page is great. A hidden gem? I've never met it before. Thanks! A hidden gem? I've never met it before. It's been around in one form or another for quite a while. 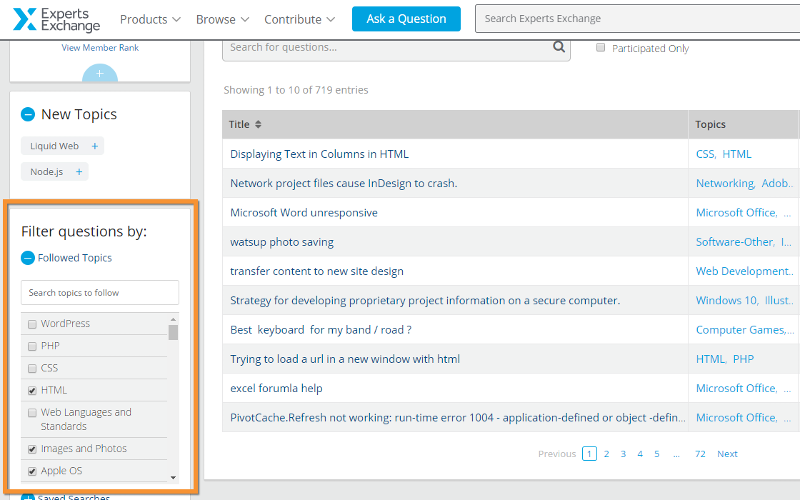 It's not very hidden either, accessed by going to Contribute > Answer Questions and available from most pages on EE. Is it possible to have the "My Followed Topic's" open in the Answers window layout? Hi compdigit44! I'm not quite sure what you mean... Do you see something like this when you go to the Answer page? >>Is it possible to have the "My Followed Topic's" open in the Answers window layout? I go to one page and see everything I care about.